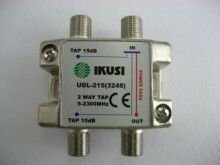 We will endeavour to supply Ikusi product wherever possible. In some cases we may send an equivalent brand of equal quality. Click the button below to add the 2 WAY 20dB Directional Coupler / Drop Tap to your wish list.